After spending four and a half months in Paris, it's sure there are certain things I'm going to miss once I'm back in Finland. But there's also absolutely gonna be some things that I'm so NOT going to miss! One such thing is my neighbour... Sometimes she's really driving me mad with her loud music, her very weird and annoying laughter and especially the fact that she obviously don't know how to use the handle on the door. She keeps slaming it everytime she walks through it. No matter if it's early in the morning, in the middle of the day or in the middle of the night. And she slams it so hard that the walls are litterally shaking! Another thing I won't miss is the buildings from the inside. Or how they don't have a good isolation. In the winter it was really freezing in my room and even though I tried to turn on some more heat, the radiator was apparently centralized so you weren't able to do anything about it. Then, when the spring came, they turned the heating off compleately! So when the sun is shining, it's actually ok in my room but when it's raining and cold outside, like it has been for the past few days, the room turns really cold again. I mean, I usually don't sleep with socks and a thick pyjamas even during the winter in Finland, but here I have to do that every night. And that feels a bit silly. On the other hand, I very much like the buildings from the outside over here. They're so beautiful with their french balconies! Before I didn't at all understand the use of a french balcony, but after spending so much time at Liss' place (because she has one of those), I've really started to understand the charm of them. I wouldn't exchange a real balcony for a french one, but these ones are still much better than no balcony at all. It brings you closer to the open air. The city itself is also very beautiful. I love the way you can find really wonderful, cosy places hidden just around the corner. Small lanes or parks that most visitors of the city doesn't even know excist. Like Parc de Belleville, for example, where we had our first real picknick for the season. A small but beautiful park right in the middle of the immigrants district. And the picknicks themselves! Oh, I love them! I could have picknicks every night! It's so amazing to for example sit on Pont des Arts with a couple of friends, eating good food and drinking champagne while enjoying the warm summer evening and the lively city around you. That's one of the best experiences I've had here. But even though it's so great to have this variety of things around you, I still know I could never live in a big city like this. 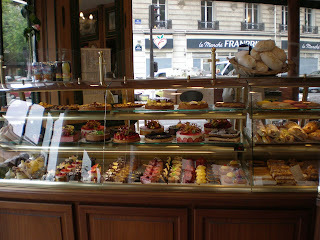 It's very convenient that you can do almost anything anytime you want since there's really almost everything in Paris. Or if you don't find what you want in Paris, it's still in the heart of Europe so it never takes too long to go somewhere else. But Paris is still too big for me (although it does seem smaller than you would think after spending some time in it). There's too much stress and traffic all the time. The city is never quiet and calm. People are always rushing somewhere and it is actually true what they say about parisians: that they're impolite and arrogant. I mean not all of them, but most of them. If you try to ask something really nicely, it's not at all rare that they just snap you back and look very, very annoyed as if you're just wasting their time. But as soon as you get outside the city, you're struck by the kindness of everyone! Really! I never thought the difference could be so huge! The only people I really like in Paris is the busdrivers because they're all really nice. They say "Bonjour" to everyone and if they see someone running towards the bus, they stop and wait for him, even though they would have already left the bus stop! That would never happen in Helsinki... So yes, I like the buses in Paris. You see so much more when you take the bus in stead of the metro and there's actually usually much fewer people on the bus too. The metro makes me depressed. I didn't notice how bad I felt before I started to take the bus in stead to Sorbonne every morning, but after that I've started to feel so much happier and now I even try to avoid the metro as much as I can. If I can, I choose the bus or even walking.